Many executives do not understand what is at risk until it is too late. Security breaches hurt a company’s reputation, may result in fines and lawsuits, and cause lost revenue. Many organizations think security has to be expensive when the reality is you probably already own everything you need. The IT department is already busy taking care of day to day issues too. Some executives only get involved in IT to approve capital expenditures. An audit by Mike Foster, CEH, CISA, CISSP takes the thinking out of the process for the executives. 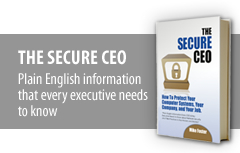 A review helps executives save money, increase profits, and protect your organization. The good news is that often, as long as you already have reasonably modern hardware and software in place, the purchases you will make from your vendors after the review will be minimal. Also, during your review, many aspects of your systems are examined—in addition to security. You want to be getting the most out of every IT dollar invested. If your network goes down, how long will it take before your organization feels the impact? If your organization processes credit cards, are you adhering to the PCI standards? Mike is unusual because not only is he a self-described computer “geek”, but he is also a gentle communicator—meaning that he can interact both with you and with your IT guy. Not only will he assess your vulnerability to hackers, but Mike brings immediate accountability to your IT department. (he knows more than your IT guy(s) knows and helps to hold them accountable to a number of issues). Lastly, Mike can bring some very helpful tools to your attention that, at least in our case, proved to be very helpful to our overall efficiency. I don’t make personal recommendations very often, but I obviously believe in Mike’s services and would encourage you to check into using them. Executives can think of the review as professional development for your IT professionals, be they in-house or outsourced IT professionals. Ensure that your organization is making the most of every IT dollar. Most of my clients’ IT professionals are top notch! IT professionals are often capable and want to do the best job possible. Technology changes so fast, especially security technology. Even the best IT professionals appreciate an outside perspective on best practices from a guide who is in touch with so many other IT professionals through continuous reviews and research. IT professionals appreciate getting their answers one-on-one from a friendly and knowledgeable specialist. Organizations benefit so much that they bring me back year after year to keep saving. Dear Mike, I wanted to take a moment to thank you for the valuable services that you recently provided to our company here in Houston, Texas. We were very impressed with the network evaluation and vulnerability assessment that you undertook on our behalf, and we have already begun to follow your recommendations on how to make our network safer and more efficient. I was thrilled to find out that the cost of your assessment was more than offset by the anticipated savings you will create for our company, and I fully expect that our IT expenses will be dropping as we implement the broad based changes you have recommended. Your evaluation was so thorough that we now plan to bring you back annually to perform the same service. I would encourage all CEO’s to talk to you to get a sense of the value add you can deliver to their companies. We are in our second year with Mike. The first year we knocked out a big chunk of weaknesses that we had. We were ready for him the second year… yet he was able to improve upon our network even more. He can always find a way to make your network stronger. I found Mike�s information to be very thorough and timely. His program exceeded my expectations at every level. His feedback, both in writing and verbally, is key to our success. Mike’s level of professionalism, his knowledge encouraged an excellent exchange of ideas. His experience and knowledge that were brought to the discussions was amazing. Working with Mike was much more productive than past experiences with consultants because his focus wasn’t overly technical, which allowed the decision-makers to better grasp our needs. I wish we could work with Mike more, at least once a year in order to keep us on track. He provided a fresh outlook from a different perspective, and the outcome of his visit was excellent. While his technical knowledge is amazing, I was most impressed with Mike’s people skills. I very much look forward to our next meeting. It was a wonderful experience listening to Mike. His presentation was great, and I learned so much in that brief period of time. I know now that what we are currently doing as far as security is probably not enough, but thanks to Mike, our eyes are open and we know the steps we need to take. Mike does a terrific job of walking the balance between business and IT issues. He connects with his audience and the subject matter. I plan to implement several of the suggestions he offered, and I now understand the urgency in having an IT audit. Your exceptional personality really welcomes group input, and makes your program entertaining and informative. Just realizing that we�re not alone in this, and that other businesses have the same IT security issues, was comforting. The pace of the program was just right, and I left feeling eager to start putting what I�d learned to good use. Mike is very good at what he does, and never lets his audience go to sleep. His jokes kept the seminar interesting, too. Just listening to what he had to say gave me a much better understanding of my risk. I’m happy he decided to quit being a CEO and became a professional IT speaker. I will be in the audience anytime Mike comes back to North Carolina! His suggestion of having the ‘geek squad’ attend his Super Tech event was genius! This was an incredible learning experience. I found the program to be very educational and Mike very engaging as a speaker. It covered a lot of ground with the appropriate level of detail. Clearly Mike is very knowledgeable on the subject. The most useful part of the program was understanding the average CEO’s level of exposure. Mike is very well spoken, but his real talent is in translating ‘tech speak’ into plain English. This was a great refresher course on IT security. The overall presentation was very informative, and I found the portions on website optimization very insightful and helpful. Mike’s examples and interaction with his audience made the program informative and enjoyable. The pace of your program was just right, and I liked the fact that your program encouraged audience interaction. For me the most important take-away was the portion on endpoint security. I definitely plan to implement your suggestions. Not only are you well informed, but you are able to communicate your information on multiple levels at the same time—to IT professionals and to the CEOs. I learned a lot from your program, and plan to check out all of the free information you supplied to us about security-related products and websites. Mike is very good at what he does, and his knowledge of IT security issues is obviously extensive. I came away with some additional tools to research, try out and put in place. I was amazed not only by the depth of your program, but also by the fact you kept everyone involved in the subject. Your discussion on laptop encryption alone would have made the trip worthwhile! I appreciated your pitch to the CEOs, many of whom are not informed enough to understand or fight for IT security. I came away with a lot of good, basic info about current IT security options and potential weaknesses. Also, many of the website examples Mike presented contained very valuable and helpful information for me. Mike’s friendly, personal style really encourages audience participation. I wish my boss would have heard you! I thoroughly enjoyed your program because it confirmed some of my security goals and offered me new ways to try and get them implemented. Mike did an amazing job, covering a lot of material in a way everyone could understand. I left with a much better understanding of 27 security issues and feeling much better prepared to deal with possible security breaches in the future. You presented a lot of great content in a way that kept it interesting and entertaining. In addition to your sound advice concerning viruses, spam, spyware and hack attempts, I also found your tips to improve website visibility very helpful. I learned a lot and enjoyed doing it. Mike did a great job of keeping the energy up throughout his program. His security ideas are so simple and easy to implement that I almost feel like I should have thought of them myself! This was time well spent, and I am going to put his advice to work immediately. Normally the content covered might have been too much, but your mix of information and humor made it all easily digestible. You gave us an outstanding security review, kept us involved and got us thinking. Mike did an outstanding job covering a broad range of topics. His knowledge is impressive, and his anecdotes and stories helped us understand his message. Thanks for the new tools you offered and the ‘wake-up call’ to management everywhere. Mike speaks our language and doesn’t get caught up in jargon or theory… he offers straight, real-world solutions I can go back and start using right away. He’s a great speaker, knows his stuff and is well worth the price. Whether management wants to admit it or not, IT security should be a growing concern for every company that does business on the Internet today. We�re lucky to have people like Mike around to help protect our interests. His content was excellent, contemporary and easy to understand. Set up your review today! Please call (707) 200-2095 to start the process.